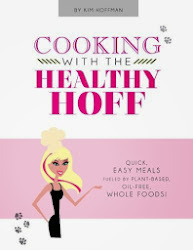 I just stumbled across Go Raw Real Live Food Chocolate at my local Heinen's and I just had to give it a try. Well with all those letters, I didn't mind dropping a little extra coin to check this stuff out. And was I not disappointed! 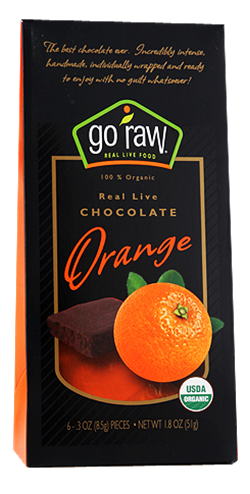 Go Raw Chocolate comes in three flavors: Original Chocolate, Mint Chocolate & Orange. Since I used to have a hard crush for those orange chocolate balls that break apart to mimic an actual orange (how I got my fruit back in the day), I opted for the Orange flavor. It's rich, it's dense, it's creamy, it's dark and with just a hint of orange it plays nicely with your taste buds. Also, I was shocked with the 1 gram of saturated fat, usually chocolate can't pull that low of a number off, the cacao base is what's driving that impressive little number. This just may become a household staple!